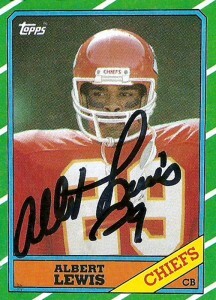 Albert Lewis was part of a fearsome secondary and special teams for the Kansas City Chiefs. With breathtaking speed for his size, Lewis could have easily been an wide receiver with his far reaching talents. Paired with Kevin Ross, Lewis and him made an impressive duo that shut down opponents passing games and frustrated receivers week in and week out. Lewis’ physical play and speed allowed him to handle both man to man and zone coverages with ease. Jerry Rice, arguably the greatest receiver of All-time called Lewis, his most difficult opponent. Still the Hall of Fame eludes Albert, since it seems to view the work of the secondary with some disdain. A 3rd round pick out of Grambling in 1983 by the Kansas City Chiefs, Albert spent 11 fine seasons as a member of the Kansas City Chiefs. He started 128 games recording 4.5 sacks, 38 picks for 329 yards, 555 tackles, and 7 FF. Deciding to go younger at the position, Albert signed with the Raiders in 1994, starting an additional 61 games for LA/ Oakland retiring after the 1998 season.